What are the new guidelines on vlogging and adverts? New guidelines have come out telling vloggers that they need to be clear and honest with their followers if they're being paid to say something is good. It's after Newsround raised a complaint, in November 2014, with the Advertising Standards Authority, which makes the rules for adverts in the UK. 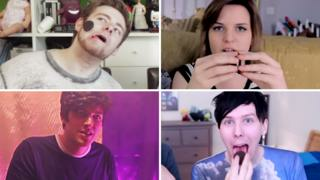 In June 2014 a group of UK vloggers were paid to say good things about a brand of Oreo biscuits. But none of the videos were clearly labelled as adverts. Newsround raised the issue with the Advertising Standards Authority, who monitor advertising in the UK. They said Newsround had to make a complaint for it to investigate further. Watch Ricky's report from November 2014. The ASA ruled that the adverts were not clearly marked, and needed to change. They said it was against their rules and vloggers should make it clear whether or not their vloggs are adverts. Mondelez, the biscuit company that paid the vloggers, said it was "disappointed" but would "ensure the adverts do not appear in their current form again". YouTube told Newsround that vloggers themselves are responsible for making videos that stick to their local laws and regulations. The vloggers affected by the ASA ruling have now changed the descriptions of their videos to make it clear they are paid advertisements, but the ASA said it would be looking at online videos much more closely in future. The ASA have spent the last few months looking at advertising in vloggs. Now they've come up with a new set of guidelines, to make it clearer. Guy Parker from the Advertising Standards Authority. Guy Parker, from the Advertising Standards Authority said, "It's important that Newsround made that complaint. "It's just not fair if we are watching a video by a vlogger and we don't know that a brand has paid for the content of that video." If a vlogger has been told to say something by a company or a big brand, they must make that clear and the video needs to be labelled as an advert. If vloggers have been paid by the company to promote an item, they have to state that somewhere. For example, they need to put something like the word "ad" or "promo" in the title of their video - or use a symbol in the thumbnail telling viewers what they're about to click on is an advert. Ricky and Leah talk through the new guidelines. The ASA hope the code will make it easier for vloggers to know what they can and can't do online. How does this affect people watching? This means that from now on, you should be able to tell the difference between an ordinary vlog and an advert. We spoke to one vlogger Chyaz, who wasn't involved in last year's investigation, about what she thinks of the new rules. Vlogger Chyaz Samuel told Newsround what she thinks. Chyaz Samuel said: "I think the clearer the better when it comes to the rules. No vlogger wants to deceive the audience." What do vloggers think about the new advertising rules?